Citizens have only recently learned of the Navy’s plans to turn large areas of the Olympic Peninsula into an “Electronic Warfare Training Range”. The Navy plans to train pilots in Electromagnetic Warfare tactics using our National Forests for their land-based emitters, which will be used in conjunction with squadrons of supersonic Growler jets. The pilots will be practicing advanced Electronic Warfare tactics in the airspace over Olympic National Park. The project poses serious threats to public health and to wildlife. More than three million visitors come to Olympic National Park every year, and thousands of families make their homes in this area. The Navy has skirted doing a comprehensive Environmental Impact Statement (EIS) for this “project” by claiming there will be “NO SIGNIFICANT IMPACT”. The US Forest Service has accepted this claim and has decided to grant the Navy a long-term permit to use our National Forest roads for mobile “emitters”, which will be emitting powerful electromagnetic radiation. Public pressure and outrage has extended the discussion to allow the testing until the end of November. Now is a critical time to show your support for this issue. The Forest Service is inviting pubic input on their decision to grant a permit to the Navy. We have a very short window of opportunity to voice our objections. The deadline for comments is Nov 28th. IMPORTANT: If objections are followed by questions, they will be much more effective. The Forest Service is required to answer each and every question they receive. (Statements of objections—regardless of merit—can be more easily dismissed, but every question you pose must be addressed.) The more questions, the better. Know that if you have already submitted objections, you can resubmit your previous comments in the form of questions, and add additional questions, as long as you do so before Nov 28th. Forest Service officials have stated that only “substantive” comments will have the power to reverse their decision. This means that you might point out where the Navy may have violated Federal law, which, in this case, is NEPA. The Navy violated NEPA procedure by their failure to adequately notify the public about their project. (Tiny notices were placed in obscure locations, and published in distant newspapers.) The public was not adequately informed, as Federal law requires. Sample Questions: Why were the communities where this testing is to be done not notified? Why were no public hearings held for the Navy’s drafting of their EA? Why were no local newspapers notified? Why were no local elected officials notified? The Navy violated NEPA procedure by not notifying or consulting with Olympic National Park as they drafted their Environmental Assessment (EA). This project will severely impact the wilderness experience for millions of visitors to the Park every year. By law, the National Park should have been consulted when the Navy was drafting their plans. Sample Questions: Why was the Olympic National Park not notified or consulted by the Navy during the drafting of this EA? (The Navy has told the public that they did consult with the Park, but this appears erroneous.) Do they have any records of their consultation with the Park? If they do, why isn’t it available for the public to see? Isn’t it the Forest Service’s responsibility to verify this? Why hasn’t the Forest Service conducted a formal investigation of this violation? The Navy violated NEPA procedure by not addressing future and cumulative impacts of the project. Federal Law requires that these be fully disclosed and analyzed. The Navy states that their project aims to “accommodate growth in future training requirements”, yet they do not specifically disclose what that growth will include, nor analyze its impacts. According to the Navy’s own briefs, the interception and disabling of signals by their planes, called Growlers, plays a central role in electronic warfare training. As such, the Navy must address this very plausible escalation in their EA. All future phases of the Electronic Warfare Training Project must be fully disclosed and evaluated in full. This is Federal law. The Navy is not permitted to disclose their plans incrementally or attempt to disguise their bigger plans by a “piecemeal” approach. USFS Ranger Dean Millett has stated that he is not considering the larger plan of the Navy’s, but is limiting his “decision space” to just the use of Forest roads for the emitters. He is not considering the supersonic jets—either their noise or their radiation—in his decision. Sample Questions: Why is not only the Navy, but the Forest Service, narrowing their focus so dramatically, when NEPA clearly states that the entire project and it impacts need to be included? Separating out partial aspects of the bigger project, (which includes many supersonic Growler jets practicing with active attack radiation), is clearly part of the future training program and needs to be fully disclosed and analyzed. Exactly how much radiation will be projected from each of the Growler jets in one day’s training as they practice their warfare tactics? Why is the Forest Service not demanding full transparency and full disclosure as Federal law mandates? The Navy violated NEPA procedure by not using the most recent and “best available science” in their conclusion that there will be “No Significant Impact” from their project. Their supporting science documents are weak and sorely outdated. Thousands of recent, peer-reviewed studies indicate there are very real harmful effects—both to humans and to wildlife—from man-made electromagnetic fields. The Navy sited only one very dated and narrow experiment on DNA fragmentation to justify their claim that electromagnetic radiation is harmless. (See the Navy’s EA 3.1.1.2). They have chosen to ignore thousands of rigorous scientific studies. The Navy’s EA is sorely deficient in this regard, and as such, it violates Federal law. When the public brought this serious deficiency to the attention of Ranger Millett, he replied that the Navy’s science is “good enough” for him. Sample Questions: Why is the Forest Service not demanding that the Navy use the most recent and best available science? Because the project will include active, focused use of electromagnetic weaponry, pointed down towards the earth, the damage to living systems will be significant. Why is the Forest Service not addressing this? Why are they allowing the Navy to manipulate the NEPA process in this manner when the flaws and deficiencies of the Navy’s EA are so blatant? Isn’t it the Forest Service’s responsibility to demand that the Navy fully disclose all impacts of this project, including the future escalation of the training? Why is the Forest Service skirting their responsibilities ? Why aren’t they protecting the forest and its visitors from this potentially harmful project? Isn’t that their responsibility? The Navy violated NEPA procedure by failing to address the impacts this electromagnetic radiation will have on bees, butterflies, birds and bats as well as a multitude of other small animals and insects. Because the current worldwide Bee Colony Collapse is such a threat to our food security, the President of the United States has called for all government agencies, including the Department of Defense and the Dept of Agriculture, to make the protection of pollinators a critical priority. Scientists have found that man-made ElectroMagnetic Radiation radically disrupts bees’ ability to navigate and find their way back to their hives. Also the Navy’s assessment does not address the harm this radiation causes to amphibians. These omissions in the Navy’s EA renders the document sorely deficient. As such, it is a violation of NEPA. Sample Questions: Why is the Forest Service not requiring the Navy to address the impacts of this project on bees, birds, bats, butterflies, and other insects as well as amphibians? Numerous scientific studies document very real harm to these creatures from man-made electromagnetic fields. Why is this being overlooked? Why is the Forest Service not requiring comprehensive studies of the flora and fauna in the forests they are supposed to be protecting? A. Noise from the airplanes: This was completely ignored in the Navy’s EA. The “soundscape” of Olympic National Park and the surrounding wilderness areas will be severely impacted by squadrons of supersonic jets practicing overhead most days of the year. This noise will also greatly impact thousands of citizens’ “quality of life” who are forced to live directly underneath these flight paths. B. Pollution: The Navy did not address the pollution, both chemical and electromagnetic, that would be produced from the airplanes. The chemical pollution alone from just one of these jets is tremendous. C. Land-use, traditional use, cultural use: Since the early 1900s, these pristine coastal regions and forests have provided critical habitat and protected sanctuary for wildlife. This area, long used by millions of visitors every year for recreation, will radically be altered by the Navy’s project. The noise, the pollution, and the electromagnetic radiation would destroy any wilderness experience and severely impact recreational use in a negative way. 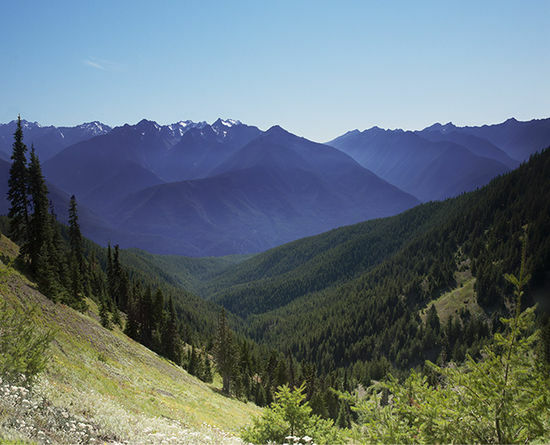 D. Economic and social impacts: Visitors to the Olympic National Park are a driving force of the economies of this region. Degrading the Park, as this project threatens to do, could have a huge negative impact on the Peninsula’s economy, as families choose to go elsewhere for their vacations because of the hazards to public health and the disruptive noise. The Olympic Peninsula would also no longer be a desirable place to live, and real estate prices could plummet. Finally, if the Forest Service grants this permit, they are in violation of their own management plan, and the National Forest Management Act. The Department of Defense does not have the right to override the Forest Service’s own management plan and this Act. Electronic warfare training is not consistent with the public purposes for which national forests are reserved. According to the US Forest Service’s own regulations, military use our public lands is not permissible if the military has other “suitable and available” lands for their proposed action. The military has hundreds of thousands of acres of remote lands that are used for just this kind of hazardous testing and training. Why aren’t they being used instead? Every viable alternative needs to be considered. Why hasn’t the Forest Service required the Navy to use these other lands that are available? Finally, the Forest Service’s own management policy states that when considering issuing such a permit, “the interests and needs of the general public shall be given priority over those of the applicant.” The public has spoken loudly about this issue and have communicated clearly what their needs and desires are. Questions: Why are the needs and desires of the general public NOT being given priority over the desires of the Navy?